Sweet Chestnuts can be cooked or stored and are very nutritious. The Sweet Chestnut Tree (latin name – Castanea sativa) grows to a height of about 30m. 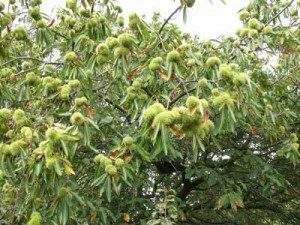 The Sweet Chestnut produces spiny fruit which encase the edible chestnut, traditionally roasted in bonfires. to reconstitute dry sweet chestnuts, put in boiling water to cover for an hour or so and use as recipe. 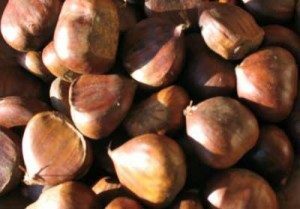 It is fun collecting the nutritious sweet chestnuts in the autumn; they can be cooked or stored.